Have you created a Spirograph as a child, or even later? If you don’t know what a Spirograph looks like, the picture below may refresh your memory. Yes, Spirograph is one of those brands like Xerox that have lesser-known, technical names. Spirographs are essentially Hypotrochoids or Epitrochoids. Even with such such technical words, Spirographs can be fun, especially when you don’t have to draw with ball point pens on paper, and can do it instead on a PowerPoint slide! Can You Use Scripts in PowerPoint? If you don’t know how to use macro snippets or scripts inside PowerPoint, look here to get started easily. Remember you need to have some shape selected before you run this code. You can change the ROTATION_INCREMENT and ROTATION_MAX values to get different graphs for your Spirographs in PowerPoint. 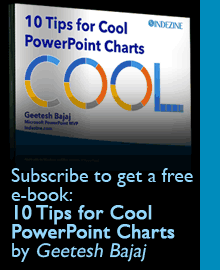 Shyam Pillai is a Microsoft PowerPoint MVP. His site has many VBA snippets, plus free and commercial PowerPoint add-ins. Among his well-known add-ins for PowerPoint are Image Importer Wizard, SecurePack, Sequential Save, and Shyam’s Toolbox. Want to create Spirographs without the programming code? Look at our Spirographs in PowerPoint tutorial.